The majority of all doctors after 2017 will be women, which will have huge implications for NHS workforce planning, a report warns. 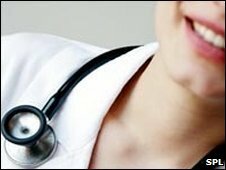 Trends show female GPs could outnumber male ones in under four years, says the Royal College of Physicians. With women more likely to want flexible working to fit with having a family, the NHS faces challenges which could affect patient care, the college warns. It says the profession would be failing patients if it ignored such concerns. The government's chief medical officer, Sir Liam Donaldson, said he would work with the profession to ensure women in medicine had "every opportunity" to progress their careers. Since the early 1990s more than half of all new medical students have been female. Compared with the early 1960s, the number of men entering medical schools each year has doubled, but for women the number has increased 10-fold. Women form a majority of entrants to most speciality training and women already make up 40% of all doctors, 42% of GPs and 28% of all consultants. But the NHS will need more doctors to provide the same amount of cover if current trends continue, the college warns. Specialties like general practice and public health medicine, with set hours, could become oversubscribed with women working part-time. Meanwhile other specialities, like surgery and anaesthesia, that typically are less appealing careers to women because of the long hours and on-call commitments, would remain male-dominated with few women rising to the top. The report says discrimination is no longer a barrier to the career progression of women doctors in the NHS - something backed by research. A study in the British Medical Journal of UK medical graduates found although a smaller proportion of women than men progressed to senior posts, the career paths of women who had always worked full-time were very similar to those of men. But there may be bitterness from colleagues about flexible working, says the RCP. "The growth in part-time work may also impose increasing organisational complexity if full-time doctors, female as well as male, begin to feel that their goodwill and availability are being overstretched by the demands of others who want to work flexibly. "More than the addition of extra crèches or more flexible child care will be needed to respond to these challenges." Professor Jane Dacre, chair of the working group which produced the report, said: "More research is essential to find out how reorganising shift patterns and access to childcare facilities will affect the choices doctors make about how they work." Sir Liam Donaldson said: "We will work with the leadership of the medical profession to ensure that women have every opportunity to realise their aspiration when they choose a career in medicine." An expert group charged with looking at barriers to successful career progress faced by female doctors will report back in the next few months, he added. Michael Summers of The Patients Association said: "We need all the doctors we can get. Whether they are male or female and working full-time or part-time matters not." He said more female doctors would mean more choice for some patients, including certain ethnic minorities that can only be examined by a female on religious grounds. Najette O'Donnell, a medical student in London and member of the BMA's Medical Student Committee, said: "It is good to see that women are breaking down barriers in the NHS and are now entering medical school in large numbers. "However, it is crucial that the health service adapts to any consequences that might flow from these changes and encourages people from all backgrounds into medicine. "Issues such as speciality choices must be examined in detail now so that we don't face serious problems in the future." The president of the Royal College of Surgeons, John Black, said: "This report provides useful evidence on how medical students choose what to specialise in and offers future areas for debate and research that will prove vital in ensuring surgery gets the best qualified candidates. "One of most interesting findings is that women tend to favour predictable work patterns, and human interaction over technical disciplines. "Managing surgical cases is both highly unpredictable and technical, going some way to explain why there are fewer women going into surgery." Dr John Heyworth, President of The College of Emergency Medicine, said: "Emergency Medicine, like many other specialties, is now attracting more women as working arrangements become more session-based and predictable. "This report and its recommendations will be critical to help us prepare for the changing gender balance ensuring the ongoing development of a high quality Emergency Medicine workforce."